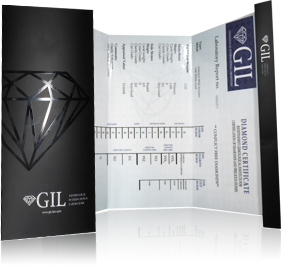 Leading gemological laboratories offer diamond certification services. The process of issuing a certificate of authenticity includes thorough inspection by expert gemologists, careful evaluation and grading. Findings are clearly drawn out on a well drafted report which also receives a unique code allowing remote online access to the copy stored in the lab’s data bank. Among other things a certificate of authenticity will show how the diamond fares for all of the four C’s and thus it provides sound foundations from which a diamond’s value may be determined. Diamond certificates of authenticity offer several important benefits. They are unbiased, professional surveys of a diamond’s traits and as such are of great value with regards to buying and selling the diamond. As their name discloses, they verify authenticity of a naturally formed diamond, any clarity enhancing treatments a diamond may have undergone will also be depicted. A diamond certificate will assure you of a diamond’s quality and will enable you to determine its worth. It is also practically indispensible so far as insurance purposes go. A diamond certification of authenticity will even increase a diamond’s overall value since it makes trading the stone easier. Our diamond experts are here to help. Need Help? Ask our diamond experts!